Anthem is a dystopian fiction novella by Russian-American writer Ayn Rand, written in 1937 and first published in 1938 in the United Kingdom. The story takes place at an unspecified future date when mankind has entered another Dark Age. Technological advancement is now carefully planned and the concept of individuality has been eliminated. A young man known as Equality 7-2521 rebels by doing secret scientific research. When his activity is discovered, he flees into the wilderness with the girl he loves. Together they plan to establish a new society based on rediscovered individualism. Rand originally conceived of the story as a play, then decided to write for magazine publication. At her agent's suggestion, she submitted it to book publishers. The novella was first published by Cassell in England. It was published in the United States only after Rand's next novel, The Fountainhead, became a best seller. Rand revised the text for the US edition, which was published in 1946. Equality 7-2521, a 21-year-old man writing by candlelight in a tunnel under the earth, tells the story of his life up to that point. He exclusively uses plural pronouns ("we", "our", "they") to refer to himself and others. He was raised like all children in his society, away from his parents in collective homes. He believes he has a "curse" that makes him learn quickly and ask many questions. He excels at the Science of Things and dreams of becoming a Scholar, but when the Council of Vocations assigns his Life Mandate, he is assigned to be a Street Sweeper. Equality 7-2521 accepts his street sweeping assignment as penance for his Transgression of Preference in secretly desiring to be a Scholar. He works with Union 5-3992 and International 4-8818, who is Equality's only friend (which is another Transgression of Preference). Despite International's protests that any exploration unauthorized by a Council is forbidden, Equality explores a tunnel and finds metal tracks. Equality believes the tunnel is from the Unmentionable Times of the distant past. He begins sneaking away from his community to use the tunnel as a laboratory for scientific experiments. He is using stolen paper to write his journal. While cleaning a road at the edge of the City, Equality meets Liberty 5-3000, a 17-year-old Peasant girl who works in the fields. He commits another transgression by thinking constantly of her, instead of waiting to be assigned a woman at the annual Time of Mating. She has dark eyes and golden hair, and he names her "The Golden One". When he speaks to her, he discovers that she also thinks of him. He reveals his secret name for her, and Liberty tells Equality she has named him "The Unconquered". Continuing his scientific work, Equality rediscovers electricity. In the ruins of the tunnel, he finds a glass box with wires that gives off light when he passes electricity through it. He decides to take his discovery to the World Council of Scholars; he thinks such a great gift to mankind will outweigh his transgressions and lead to him being made a Scholar. However, one night his absence from the Home of the Street Sweepers is noticed. He is whipped and held in the Palace of Corrective Detention. The night before the World Council of Scholars is set to meet, he easily escapes; there are no guards because no one has ever attempted escape before. The next day he presents his work to the World Council of Scholars. Horrified that he has done unauthorized research, they assail him as a "wretch" and a "gutter cleaner" and say he must be punished. They want to destroy his discovery so it will not disrupt the plans of the World Council and the Department of Candles. Equality seizes the box, cursing the council before fleeing into the forest that lies outside the City. In the forest, Equality sees himself as damned for having left his fellow men, but he enjoys his freedom. No one will pursue him into this forbidden place. He only misses the Golden One. On his second day of living in the forest, the Golden One appears; she followed him into the forest. They live together in the forest and try to express their love for one another, but they lack the words to speak of love as individuals. They find a house from the Unmentionable Times in the mountains and decide to live in it. While reading books from the house's library, Equality discovers the word "I" and tells the Golden One about it. Having rediscovered individuality, they give themselves new names from the books: Equality becomes "Prometheus" and Liberty becomes "Gaea". Gaea is pregnant with Prometheus' child. Prometheus wonders how men in the past could have given up their individuality; he plans a future in which they will regain it. Ayn Rand initially conceived Anthem as a play when she was a teenager living in Soviet Russia. After migrating to the United States, Rand didn't think of writing Anthem, but reconsidered after reading a short story in The Saturday Evening Post set in the future. [note 1] Seeing that mainstream magazines would publish speculative fiction, she decided to try submitting Anthem to them. She wrote the story in the summer of 1937, while taking a break from research she was doing for her next novel, The Fountainhead. Rand's working title was Ego. Leonard Peikoff explains the meaning behind this title: "[Rand] is (implicitly) upholding the central principles of her philosophy and of her heroes: reason, values, volition, individualism." Thinking that the original title was too blunt, unemotional, and would give away too much of the theme, Rand changed the title to Anthem. "The present novel, in Miss Rand's mind, was from the outset an ode to man's ego. It was not difficult, therefore, to change the working title: to move from 'ego' to 'ode' or 'anthem', leaving the object celebrated by the ode to be discovered by the reader." A novel taking the form of a secret diary or journal. People are identified by codes instead of names. Children separated from their parents and brought up by the State. Individualism disposed of in favor of collective will. A male protagonist who discovers individuality through his relationship with a female character. A forest as a 'free' place outside the dystopian city. The protagonist discovers a link to the past, when people were free, in a tunnel under the Earth. There are also a number of differences between the two stories. For example, the society of We is in no scientific or technological decay, featuring X-rays, airplanes, microphones, and so on. In contrast, the people of Anthem believe that the world is flat and the sun revolves around it, and that bleeding people is a decent form of medicine. The similarities have led to speculation about whether Rand's story was directly influenced by Zamyatin's. However, there is little evidence that Rand was influenced by or even read Zamyatin's work, and she never mentioned it in discussions of her life in Russia. 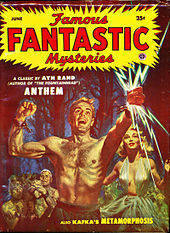 Anthem was reprinted in the June 1953 issue of the pulp magazine Famous Fantastic Mysteries. Initially, Rand planned on publishing Anthem as a magazine story or serial, but her agent encouraged her to publish it as a book. She submitted it simultaneously to Macmillan Publishers in America and Cassell in England. Both had handled her previous novel, We the Living. Cassell agreed to publish Anthem, but Macmillan declined it. According to Peikoff, "[Macmillan's] comment was: the author does not understand socialism." Another American publisher also turned it down, and Rand's agent was unable to sell it as a magazine serial. Cassell published it in England in 1938. 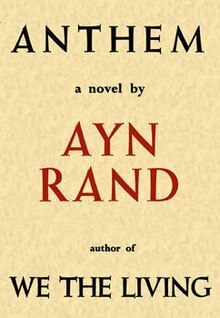 After the success of The Fountainhead, a revised edition of Anthem was published in the US in 1946 by Pamphleteers, Inc., a small libertarian-oriented publishing house owned by Rand's friends Leonard Read and William C. Mullendore. The original English edition (Cassell 1938) entered the public domain in the United States in 1966, due to the failure to renew its copyright after 28 years as then required by US copyright law. A 50th Anniversary Edition was published in 1995, including an appendix which reproduces the Cassell edition with Rand's handwritten editorial changes. Since its publication in 1946, the revised version of Anthem has sold more than 3.5 million copies. The original UK edition received mostly positive reviews; several praised Rand's imagination and her support of individualism. In The Sunday Times, reviewer Dilys Powell complimented its "simplicity and sincerity". Anti-communist journalist Malcolm Muggeridge gave a mixed review in The Daily Telegraph, saying it had appeal, but its dystopia was not believable. A short review by Maurice Richardson in The Observer said it was "highly unconvincing, in spite of some extremely eloquent writing". Reviewing the 1953 American edition for a genre audience, Anthony Boucher and J. Francis McComas were unsympathetic. Saying that "Rand implies that a sinister conspiracy of purveyors of brotherhood has prevented its American publication until now", they ironically concluded, "One can only regret that the conspiracy finally broke down." The Libertarian Futurist Society awarded Anthem its Hall of Fame Award in 1987. In 2014, Anthem was nominated for a Retrospective Hugo Award for "Best Novella". Following the release of Anthem in the United States, Rand explored opportunities for having it adapted to other media. She had discussions about potential film, opera, and ballet adaptations, but these projects were never realized. In 1950, a radio adaptation was done for The Freedom Story, a weekly radio program produced by Spiritual Mobilization, a Christian libertarian group. In 1991, Michael Paxton wrote, directed, and co-produced a stage adaptation of Anthem, which appeared at the Lex Theater in Hollywood. In 2011, Anthem was adapted into a graphic novel by Charles Santino, with artwork by Joe Staton. In the same year it was released as an unabridged audiobook by ABN, the narration by Jason McCoy described as 'stirring and evocative'. The book was adapted into a stage play in 2013 by Jeff Britting, the department manager of the Ayn Rand Archives at the Ayn Rand Institute. First performed in Denver, it opened Off-Broadway in September 2013 at the Jerome Robbins Theater. The New York Times review stated, "For a play that celebrates the individual, Anthem sure doesn’t trust its audience. Instead of illustrating ideas, this sporadically interesting show too often delivers exposition, desperate to overexplain rather than risk a moment of misunderstanding." The novella inspired a spoof rock musical, premiering Off-Broadway at the Lynn Redgrave Theatre in May 2014. The cast included Randy Jones of The Village People, Jason Gotay, Jenna Leigh Green, Remy Zaken, and Ashley Kate Adams. The review in The New York Times criticized the acting of the leads, but called the show "exuberant" and better than a straight adaptation. The work has inspired many musical pieces, including full-length albums. According to Enzo Stuarti, Pat Boone composed the music and his friend Frank Lovejoy wrote the lyrics of the song "Prelude", featured in the album Stuarti Arrives at Carnegie Hall. The song begins with a line right out of Anthem. In another point of the song it reads: "...I guard my treasures: my thought, my will, my land, and my freedom. And the greatest of these is freedom." In Anthem, it reads: "...I guard my treasures: my thought, my will, my land, my freedom. And the greatest of these is freedom." A memo to Rand dated May 4, 1964, mentions the unauthorized adaptation, but there is no indication that she took any legal action. Robert Silverberg's 1971 novel A Time of Changes also depicts a society where I is a forbidden word and where the protagonist rebels against this prohibition. In a 2009 preface to a reprint edition of his novel, Silverberg said he had read Anthem in 1953, but had long forgotten it when he wrote A Time of Changes. He was surprised to see the similarities when he rediscovered Rand's story, but said overall the two books are very different. Anthem is also credited by Neil Peart for influencing Rush's "2112" with strong parallels to the plot, structure, and theme of Anthem. Peart has said that although he had read Anthem, he was not consciously thinking of the story when he wrote the song; however when the similarities were pointed out, he realized that there must have been some unconscious influence, and gave credit to "the genius of Ayn Rand" in the liner notes. The band also released a song called "Anthem" on their Fly by Night album, and their Canadian record label (co-founded by Rush manager Ray Danniels) is Anthem Records. ^ The story Rand read was probably "By the Waters of Babylon" by Stephen Vincent Benét, which was published as "The Place of the Gods" in the July 31, 1937 issue of the Post. ^ Richardson, Maurice (June 26, 1938). "New Novels: A Knot in the Old School Tie". The Observer – via Newspapers.com. ^ "Recommended Reading". The Magazine of Fantasy & Science Fiction. October 1953. p. 72. ^ "Prometheus Awards". Libertarian Futurist Society. Retrieved July 6, 2014. ^ "1939 Retro-Hugo Awards". The Hugo Awards. Retrieved July 6, 2014. ^ "Anthem (Stage Play version)". michaelpaxton.com. Retrieved October 26, 2017. ^ Randle, Robert. "Anthem: A Graphic Novel". New York Journal of Books. Retrieved January 3, 2015. ^ Jarorowski, Ken (October 8, 2013). "The Me Generation Would Struggle Here". p. C6. ^ Anders, Charlie Jane (April 4, 2014). "At Long Last, We're Getting An Ayn Rand Musical". io9. Retrieved May 21, 2014. ^ Webster, Andy (May 29, 2014). "Songs, Jokes and Twirls? Just Don't Tell Ayn Rand". p. C3. Gimpelevich, Zina (1997). "'We' and 'I' in Zamyatin's We and Rand's Anthem". Germano-Slavica. 10 (1): 13–23. Gladstein, Mimi Reisel & Sciabarra, Chris Matthew, eds. (1999). Feminist Interpretations of Ayn Rand. Re-reading the Canon series. University Park, Pennsylvania: Pennsylvania State University Press. ISBN 0-271-01830-5. OCLC 38885754. Mayhew, Robert, ed. (2005). Essays on Ayn Rand's Anthem. Lanham, Maryland: Lexington Books. ISBN 0-7391-1030-6. OCLC 255289400. Perinn, Vincent L. (1990). Ayn Rand: First Descriptive Bibliography. Rockville, Maryland: Quill & Brush. ISBN 0-9610494-8-0. OCLC 23216055. Rand, Ayn (1995) . Anthem. Introduction and appendix by Leonard Peikoff (50th anniversary ed.). New York: Dutton. ISBN 0-525-94015-4. OCLC 317624468. Rand, Ayn (2000). Boeckmann, Tore (ed.). The Art of Fiction: A Guide for Writers and Readers. New York: Plume. ISBN 0-452-28154-7. OCLC 934792412. Saint-Andre, Peter (Spring 2003). "Zamyatin and Rand". Journal of Ayn Rand Studies. 4 (2): 285–304. Silverberg, Robert (2009) . "Preface". A Time of Changes. New York: Tom Doherty Associates. ISBN 978-0-7653-2231-9. OCLC 836855251. Wikimedia Commons has media related to Anthem (novella).